Whipper Snappers is one of the best restaurants in Branson that offers awesome seafood buffet. Guests in this buffet restaurant have the chance always to enjoy whole lobster, crab legs, crawfish, shrimp, gumbo, clam strips, and much more. Whipper Snappers also provide full service menu. Their menu selections include appetizers such as cheese fries, clam strips, popcorn shrimp as well as sandwiches including Whipper Snapper Burger and the Grilled “Chicken of the Sea” Sandwich. This fantastic restaurant in Branson offers the only All-You-Can-Eat Lobsters and Crab Legs buffet in the area. Entrees at Whipper Snappers include Chicken Fried Steak, Shrimp Dinner, hand-cut 8 oz. Rib Eye, and award-winning Fried Chicken Dinner. This locally owned restaurant has been in business since 1995 and serving a very satisfied customers. This restaurant in Branson is both a favorite of locals and visitors alike. As one of the most popular seafood restaurants in Branson, Whipper Snappers offers delicious selections on the buffet table such as rolls, several desserts, and a fully stocked salad bar. Serving breakfast, lunch, and dinner, Whipper Snappers offers a full menu for each meal. But the most popular thing that Whipper Snappers is offering its customers is the all-you-can-eat seafood buffet. Lobster, oysters, crab legs, and more can be yours for a just a very reasonable price. The seafood buffet also includes veggies, rolls, desserts, and the salad bar. If seafood is not your favorite, then you can try other great entrees such as steak, chicken, pasta, and sandwiches. At Whipper Snapper’s, you are sure to find something that you have been craving for. Whipper Snappers is truly a seafood lover’s paradise with all the variety of choices of food that you can enjoy on their seafood buffet. But food lovers shouldn’t be worried if seafood isn’t your food preference. You can feast on great steaks, wide selection of chicken dishes, and classic burgers. The restaurant also offers special menu for kids up to 10 years old. If you haven’t ever experienced opening a whole lobster, the wait staff are trained in getting all the wonderful meat out of the tasty lobsters and are more than happy to give you some helpful tips. Whipper Snappers is a great place to indulge yourself for the most favorite seafood delicacies at an affordable price. After tasting their delicious seafood buffet, you won’t want to miss this fabulous restaurant in Branson. 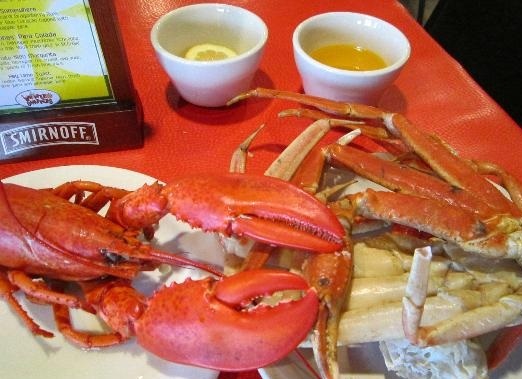 If you want to enjoy a satisfying seafood buffet at Whipper Snappers, add a couple of lemon wedges to your plate and sprinkle on your lobster for that succulent flavor you may be craving for. By enjoying a great time with the seafood buffet at Whipper Snappers, you can literally eat as many lobsters and crablegs that you wanted. The salad bar features a few side items such as mashed potatoes, corn, greenbeans, macaroni salad, and more. So, if you are looking for a seafood restaurant in Branson that offers awesome seafood buffet, then you should try Whipper Snapper.